We’d love your help. Let us know what’s wrong with this preview of The Vile Village by Lemony Snicket. You have undoubtedly picked up this book by mistake, so please put it down. Nobody in their right mind would read this particular book about the lives of Violet, Klaus, and Sunny Baudelaire on purpose, because each dismal moment of their stay in the village of V.F.D. has been faithfully and dreadfully recorded in these pages. I can think of no single reason why anyone would want to open a book containing such unpleasant matters as migrating crows, an angry mob, a newspaper headline, the arrest of innocent people, the Deluxe Cell, and some very strange hats. It is my solemn and sacred occupation to research each detail of the Baudelaire children's lives and write them all down, but you may prefer to do some other solemn and sacred thing, such as reading another book instead. To ask other readers questions about The Vile Village, please sign up. Is this something being read to a child or does it have merit for an adult reader? What does the secret vfd mean? After finishing up The Ersatz Elevator, we couldn’t wait to start this installment with hopes that the Baudelaires would find a way to locate and save their friends the Quagmire triplets. The book begins with the Baudelaires once again in Mr. Poe’s incompetent hands as he attempts to find them a new and safe home. This time, he’s exhausted all options and finds it extremely difficult locating a place for them. The children are informed that they’ll be living at V.F.D, a.k.a. The Village of Fowl After finishing up The Ersatz Elevator, we couldn’t wait to start this installment with hopes that the Baudelaires would find a way to locate and save their friends the Quagmire triplets. The book begins with the Baudelaires once again in Mr. Poe’s incompetent hands as he attempts to find them a new and safe home. This time, he’s exhausted all options and finds it extremely difficult locating a place for them. The children are informed that they’ll be living at V.F.D, a.k.a. The Village of Fowl Devotees, where there are rules for pretty much everything under the sun. This particular town believes in the aphorism, “It takes a village to raise a child” which is the entire basis for taking the children in. This book was quite slow for the first half, but then we ended up flying through the second half because it’s fairly action packed. The story itself wasn’t as comical, but there are additional characters which was nice. There's also an interesting mystery to it and it's fairly unpredictable. Also Hector is a frustrating guardian, but I also feel really bad for him. He's socially anxious poor guy. • so I reread the first 6 books obsessively as a kid because I had them on audio...but not this one! I didn't like this one as much. The kids are sent to a vile village to live. It was filled with weirdos and crows. And of course Count Olaf, I'm beginning to think he has a tracking device on them ! And the mystery of the Quagmire Triplets grows! I am legally obligated to begin every review of my reread of these books with the following sentiment: I LOVE THIS SERIES SO MUCH. Also this wasn’t my FAVORITE of the series. Which really, if you think about it? A book in my favorite series that isn’t necessarily my favorite of the series - still pretty good. Not the end of the world or anything. Ma I am legally obligated to begin every review of my reread of these books with the following sentiment: I LOVE THIS SERIES SO MUCH. Maybe the fact that I was slumping so hard that even a children’s book in a world I adore took me 5 days to read has something to do with it. Or maybe I just love to complain even when it comes to my FAVORITE SERIES OF ALL TIME. Bottom line: I hate myself. The Vile Village is where the whole VFD thing really starts to take off and the original formula of a new guardian followed by Olaaf turning up in a new disguise starts fraying. The village is quite fun, replete with dozens of vile villagers, hundreds of ridiculous rules, and thousands upon thousands of crows. The off-beat humour continues with Sunny's one worders and their elaborate translation, and the extreme stupidity of everyone who isn't a Baudelaire. The penalty for breaking almost any villa The Vile Village is where the whole VFD thing really starts to take off and the original formula of a new guardian followed by Olaaf turning up in a new disguise starts fraying. The penalty for breaking almost any village law is to be burned at the stake - which seems pretty gruesome in a children's story. And we come pretty close to seeing it carried out. Perhaps though this story is most memorable for the WORST INVENTION EVER. Violet's inventing skills are put to the test when the children need to break out of a jail cell. The solution is to pour water from a jug ... along a bench ... and onto the wall where it ... weakens the mortar between the bricks. The water is then mopped up with bread, the bread is squeezed over the jug, the process is repeated. ... and it works. The Quagmires are back again. The Baudelaires hunt for them in a book-spanning plot that makes no sense at all, involving clues sent by the Quagmires. And they're eventually found in a location ... that, at the risk of repeating myself, MAKES NO SENSE AT ALL. In fact, very little of this book makes any sense. But, Celyn enjoyed me reading it to her, and it's an OK book, little better or worse than its mid-series predecessors. Here at the halfway point of the series, the author is finally dropping more hints and clues about what seems to be a rather large conspiracy against the Baudelaire orphans, the Quagmire orphans, and I gather orphans everywhere who have large fortunes to be acquired. The search for the Quagmire triplets in The Ersatz Elevator ended with a literal red herring, but The Vile Village is almost entirely red herring, as the children are sent to become the wards of a village known only by the mysteriou Here at the halfway point of the series, the author is finally dropping more hints and clues about what seems to be a rather large conspiracy against the Baudelaire orphans, the Quagmire orphans, and I gather orphans everywhere who have large fortunes to be acquired. The search for the Quagmire triplets in The Ersatz Elevator ended with a literal red herring, but The Vile Village is almost entirely red herring, as the children are sent to become the wards of a village known only by the mysterious letters "V.F.D." Having chased the meaning of these letters since the end of the fifth book, the orphans believe they're close to an answer. Though answers are not necessarily forthcoming, the new clues continue to be tantalizing, a word which here means "something that increases your enjoyment of the series in spite of the figurative red herrings." The Vile Village is the seventh novel in the children's book series A Series of Unfortunate Events by Lemony Snicket (the pen name of American author Daniel Handler), which consists of 13 children's novels that follow the turbulent lives of Violet, Klaus, and Sunny Baudelaire after their parents' death. The children are placed in the custody of their distant cousin/uncle Count Olaf, who attempts to steal their inheritance. After the Baudelaires are removed from his care by their parents' estate executor, Mr. Poe, Olaf begins to doggedly hunt the children down, bringing about the serial slaughter and demise of a multitude of characters. In The Vile Village (First Published: 2001, Publisher: HarperCollins), the Baudelaire orphans are taken into the care of a whole village, only to find lots of rules and chores, evil seniors, as well Count Olaf and his evil girlfriend lurking nearby. بچهها به یه دهکده سپرده میشن و ماجراجوییها ادامه داره. نیمه اول کتاب که معماییتر بود رو بیشتر دوست داشتم. انگار هر بار وقتی سر و کلهی اولاف پیدا میشه دست نویسنده تا حدی رو میشه! «توی بلاتکلیفی بودن» یعنی وضعیتی که همه چیز گیجکننده و خطرناک به نظر بیاید و آدم نداند باید چه کار کند؛ این یکی از ناخوشایندترین موقعیتهایی است که ممکن است کسی با آن روبهرو شود. بچه‌ها به یه دهکده سپرده می‌شن و ماجراجویی‌ها ادامه داره. نیمه اول کتاب که معمایی‌تر بود رو بیشتر دوست داشتم. انگار هر بار وقتی سر و کله‌ی اولاف پیدا می‌شه دست نویسنده تا حدی رو می‌شه! I don't really have a lot to say about this book. It was ok, there were some cute parts. I like that the book always has some spot-on satire about society and adults especially. This book did push the series along a bit but I'm getting tired of the formula with these books. Orphans go to terrible place, all the adults are horrible human beings, the orphans are forced to do insane things for the adults, one adult is always nice but useless and in the end they escape but just barely. I did think this one had a couple of moments that were a bit darker, which I always appreciate but overall I pushed to get through it. It's a very fast read though. I read it in like an hour or two. It was nice to dive back into this series after taking a little break from it! This book is definitely one of the stranger ones in the series in my eyes. Something about a village adopting children and the crows mixed together was incredibly creepy! But that doesn't mean I enjoyed this book any less, in fact I think it made me enjoy it more. As the series goes on, the books really become more intricate and mature and I find that's particularly prominent in this one! This was bizarre but another fun read! It genuinely had me anxious as times and worried for what was going to happen. I'm enjoying the way the plot is starting to somewhat (very slightly) deviate away from the original formula and new characters, mysteries and objectives are being added. I'm still not entirely sure where this series is heading (although I have my guesses) so I'm still very intrigued! If I had to draw a line in the sand with the Snicket books between overly formulaic but funny, and genuinely well put together, I'd put it within the first few chapters of The Vile Village. There's a few things absent from this read through, most of them positive. He isn't constantly reiterating the three children's skills in a "this is for Violet, this is for Klaus, this is for Sunny" sort of rhythm. There guardian is slightly more relatable, and altogether decent guy who gets severely skittish If I had to draw a line in the sand with the Snicket books between overly formulaic but funny, and genuinely well put together, I'd put it within the first few chapters of The Vile Village. There's a few things absent from this read through, most of them positive. He isn't constantly reiterating the three children's skills in a "this is for Violet, this is for Klaus, this is for Sunny" sort of rhythm. There guardian is slightly more relatable, and altogether decent guy who gets severely skittish around authority. And they actually get some answers to the larger mysteries along with a growing integration of Lemony Snicket as a character rather than a pure narrator. Plus it just flat out reads better. The structure is looser, giving more room for whimsical turns of events. If there's an over-arching theme to the Unfortunate Events, it's the perils of adulthood. Every book discusses the dismissiveness of adults towards children, but each covers more specific territory. In this case, it's legalism, as the town they're adopted by is run by old people obsessed with maintaining a seemingly self-contradicting body of laws. Snicket works in defiance of the Nickelodeon model of pro-kid entertainment, where kids are constantly triumphing over adults. Most savvy kids get irritated with this after a while, as they spend most of their childhood getting regularly thwarted by adults. Power fantasies only hold the attention of some people for a short time. Instead he treats childhood as a kind of tragedy, where foolhardy adults with their various issues often railroad kids into terrible lives. What's secretly positive about this very bleak series is that the only way the children outwit adults is through positive traits like self-reliance, critical analysis, and research. Klaus actually reads the entire rulebook for the town, something none of the elders actually appear to have done. The most lackluster, nonsensical and frustrating of the series so far. Regardless, I love the Baudelaires with all my heart and can't wait to devour the next book! El mejor hasta ahora sin duda ninguna. POR FIN le pasa a estos niños algo """bueno""". 2.5 stars. Not my favourite by far in the series. "For sapphires we are held in here. Only you can end our fear." This is definitely my least favorite out of the whole series so far. It was just okay, nothing exciting happens in here. I liked at the beginning the idea of the entire village that adopts the kids and all the absurd rules that were created for the habitants. Then it became pretty boring to be honest. The most exciting part was definitely the "riddles" that were left for the children by their missing friends. It was fun to build the whole poem slowly and find out what really meant in the end. Another flaw is that there's basically no Count Olaf here, so maybe that's a fact that made this book way less exciting. He's no messing with the kids that much, there's almost no disguise and interaction with them. Another great installment of this series. I did predict quite a bit, but that is to be expected of a middle grade book lol. I don't have too much to say about these books after a certain point because my opinion on all of them is pretty universal: I love this series, and I need to read book 8 so I can finish season 2 of the Netflix show! "'Normally I don't approve of children staying up late,' he said finally, 'unless they are reading a very Another great installment of this series. I did predict quite a bit, but that is to be expected of a middle grade book lol. "'Normally I don't approve of children staying up late,' he said finally, 'unless they are reading a very good book, seeing a wonderful movie, or attending a dinner party with fascinating guests.'" (view spoiler)[ What does V.F.D. stand for??? I figured out that V. stands for volunteer with my elite deduction skills, but besides that I need to know! I am actually enjoying reading this series. I think I liked the first 3 books best but this one was fine. I would love to read another type of book or series from this author sometime. Seventh book already and the plot of this one doesn't really differ much from its predecessors. And I'm getting a bit tired of it... And I am so frustrated about the adult's logic in this world! The same thing happens over and over, yet no one believes the Baudeliere children. I feel like the readers haven't been given answers to the bigger mysteries of this series. Although, Lemony Snicket is slowly dropping hints and facts of a bigger overall series storyline here, sometimes, I still can't help but feel like it's kind of a drag. I'm hoping the next books would somehow pick up from there and have some diversity. Maybe if I was still a teenager, I'd enjoy it more. This series is starting to improve and I'm liking it even more despite the fact that it is so repeatative. I am now soooooo excited for the TV show coming out next month!!!!! This review has been hidden because it contains spoilers. To view it, click here. Finally, finally, finally! I loved this one. I've gone beyond simply admiring the wit of the author and am seeing the makings of a great fictional world in this tale. First of all, with Hector, we have the first character over the age of 14 who functions at a basic human level and is not a criminal mastermind. He listens with an open mind, takes notice of others outside of himself, and EVOLVES AS THE STORY PROGRESSES. He goes from a kindly (albeit cowardly) man to something of a hero when he fina Finally, finally, finally! I loved this one. I've gone beyond simply admiring the wit of the author and am seeing the makings of a great fictional world in this tale. First of all, with Hector, we have the first character over the age of 14 who functions at a basic human level and is not a criminal mastermind. He listens with an open mind, takes notice of others outside of himself, and EVOLVES AS THE STORY PROGRESSES. He goes from a kindly (albeit cowardly) man to something of a hero when he finally learns to speak up for himself and others in order to do the right thing. That is what has been missing from the caricatures that pass for adults in this series. I found myself worrying about the safety of the Quagmire children, and biting my nails when I thought the six of them wouldn't get away on the balloon in the end. This is because this time, the story introduced me to characters to whom I could relate, and about whom I could care. Even more importantly, the conspiracy and continuity of the storyline has finally taken center stage. We are now less concerned with isolated incidents that happen to the orphans and more focused on consolidating and analyzing little hints from all of the books to solve the overarching puzzle. It sharpens the readers' skills and heightens their interest. Exciting ending, very boring beginning. This is probably my least favorite in the series so far. Nothing really happened. When stuff did happen, it was connected to a setting and characters that just don't work for this series. I'm sure the TV adaptation will be much better! Well, I'm more than halfway through now! And it's pretty crazy how little I actually know about the overarching mystery of the series. I loved the absurdity of V.F.D., the Elders who wore crow hats, the thousands of pointless rules, burning people at the stake, the constant migration of the crows. Watch as mob mentality seizes the villagers and you find yourself reading bizarre chants like, (view spoiler)["Burn the orphans! Burn the orphans!" (hide spoiler)] Grab your torches and pitchforks, folk Well, I'm more than halfway through now! And it's pretty crazy how little I actually know about the overarching mystery of the series. I loved the absurdity of V.F.D., the Elders who wore crow hats, the thousands of pointless rules, burning people at the stake, the constant migration of the crows. Watch as mob mentality seizes the villagers and you find yourself reading bizarre chants like, (view spoiler)["Burn the orphans! Burn the orphans!" (hide spoiler)] Grab your torches and pitchforks, folks! Poor Jacques. Poor Baudelaires. Poor Quagmires. It really is all downhill from this book on when it comes to the Baudelaire children’s miserable experiences, but uphill when it comes to storytelling. no Mr. Poe to save (ruin) the day? That was a very nice twist. Enjoyed this one the most out of the seven I have read! 03/04/19 This one is probably my least favorite. It just doesn’t captivate me like the others. 01/31/17 Ughhhhhhhhh. And also, whyyyyyyyyyy? 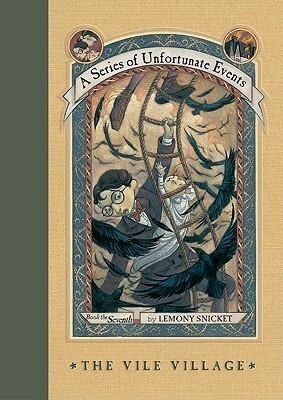 The Vile Village is the seventh installment of the A Series of Unfortunate Events series. It was a really one that kind of threw me for a loop. My freaking favorite character, Sunny, was definitely the reason why. Okay so this village is, again, weird. The people and basically everything about it is weird. I pretty much blame this whole weird creepy village for the kids acting stranger than they usually are. For instance, Sunny was just ugh in it. I mean, she eventually came a Uhh... interesting? Okay so this village is, again, weird. The people and basically everything about it is weird. I pretty much blame this whole weird creepy village for the kids acting stranger than they usually are. For instance, Sunny was just ugh in it. I mean, she eventually came around to something likable.. but still, why the change? Then there's the whole sibling fighting thing - which is very common, but it broke my heart a little bit. When we were together I felt breathless.